I’ve got some new work to share, my first major painting since I’ve been back in El Paso!! (Three cheers!) I knew it would happen. Painting became such a part of my daily routine while the girls and I were living in Pennsylvania. I knew I wouldn’t quit working regularly just because my life turned upside-down…again. I just didn’t think it would happen so quickly. But thanks to my brother-in-law and his wife I had a new painting project before I even began my journey back to west Texas. To celebrate what a small yet epic accomplishment this is for me I’m going to share with you a visual journey in reverse of how this painting evolved. 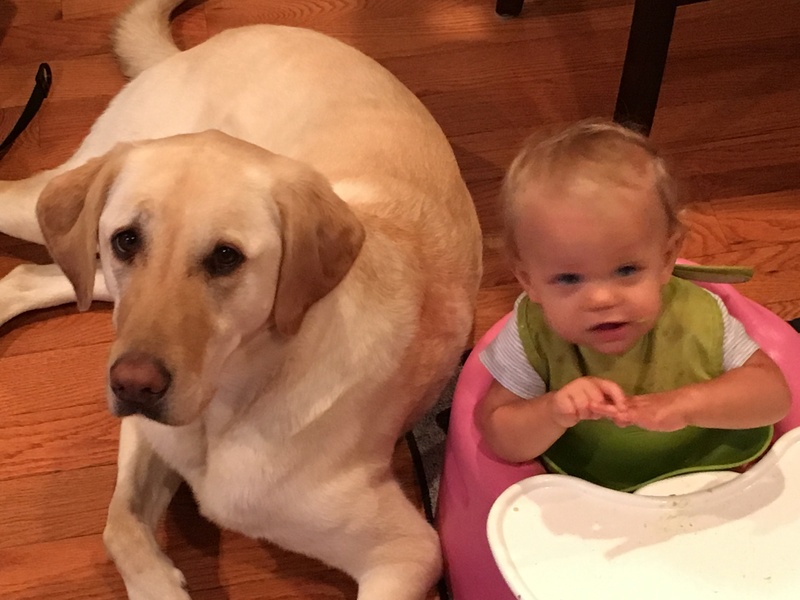 Matt and Meredith have a yellow Labrador Retriever that they adore. Her name is Butter. They have also recently become parents to a sweet baby boy who is now the epicenter of their world. In celebrating the joy that is their son they wanted a portrait of the dog for the boy’s room. They wanted more than just a painting of the dog. 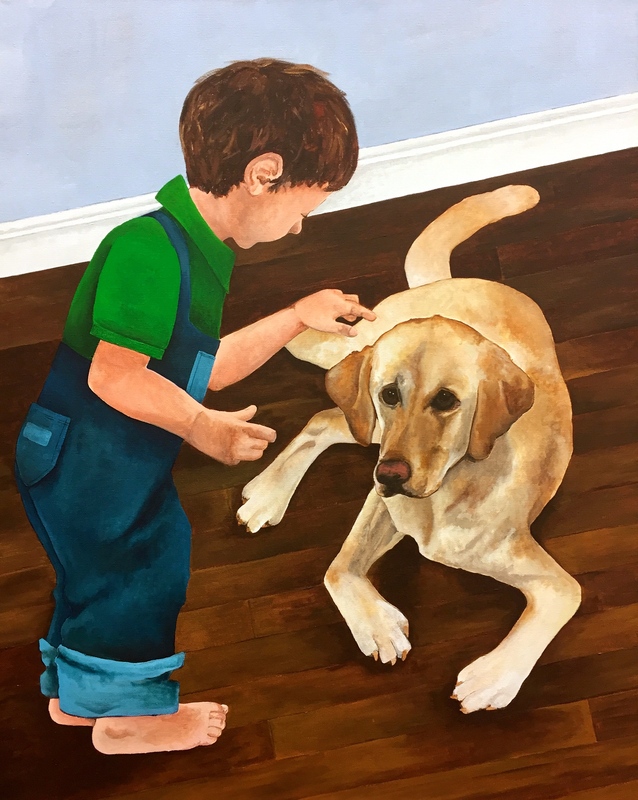 They wanted the painting to be about the boy and his dog. 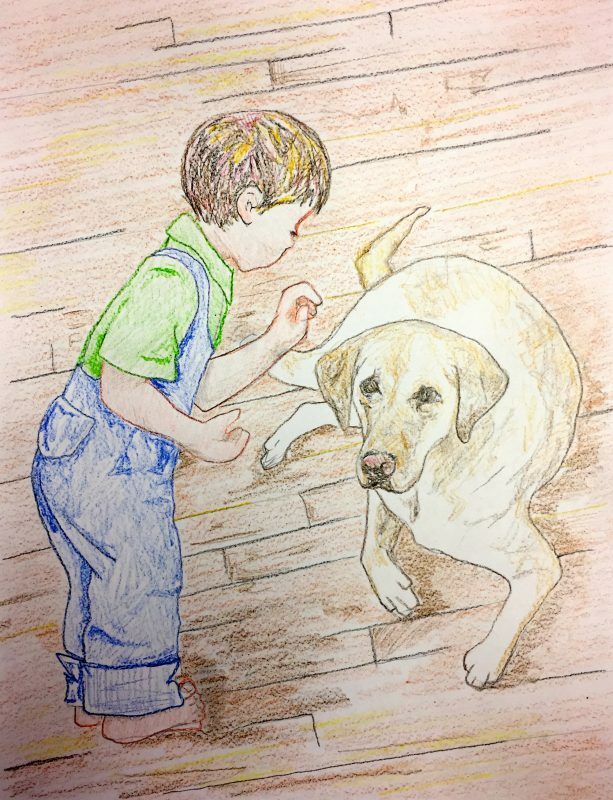 There is no relationship in life more iconic than this, so I illustrated, for baby Matthew and Butter, a snapshot of a moment in time of the friendship they will enjoy. The two figures featured in the composition aren’t doing anything beyond indulging in one another’s company. 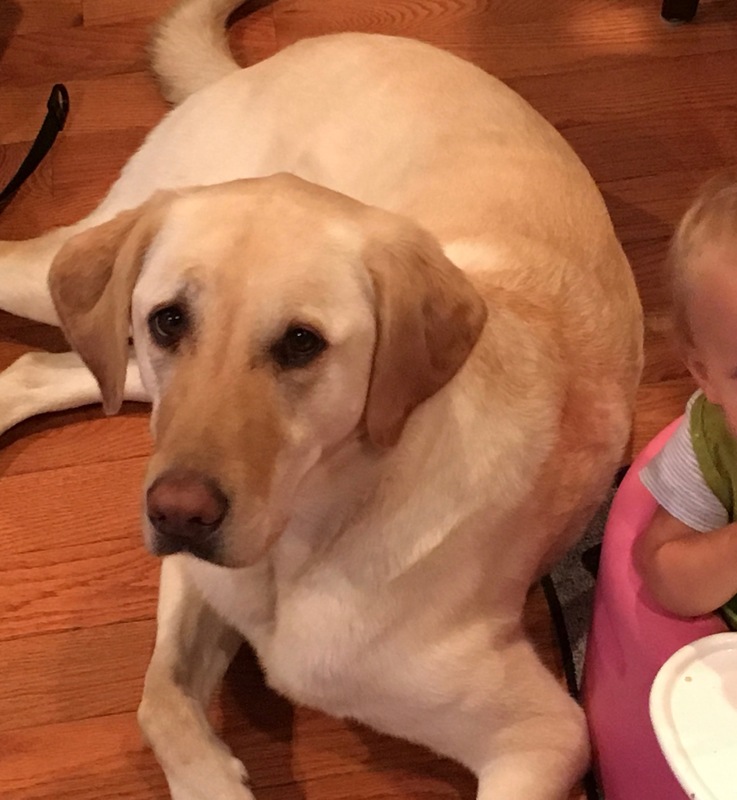 They are hanging out on the floor the way toddlers and dogs do, planning their next adventure. Upon the completion of each painting I reflect on what it took to compose. I like to document the length of the process, the supplies used, and any other unique details. It makes me more efficient in planning and giving estimates for future commissions. This work was barely in accordance with paintings that have preceded it. 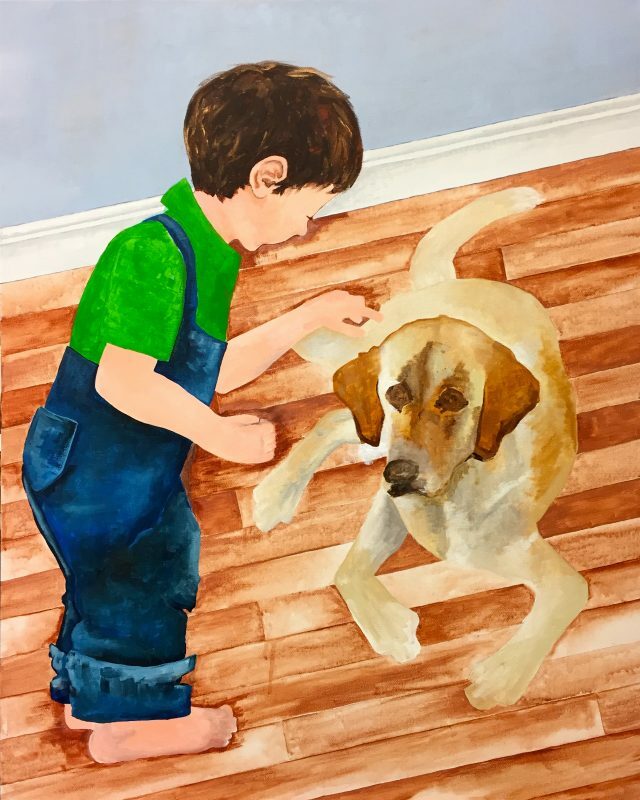 For me, painting this boy and his dog was standard in the physical way I made the picture, but every other aspect was new. I sketched the composition on the canvas as usual. Then I painted in three layers. The primary layer is big blocks of bright color. 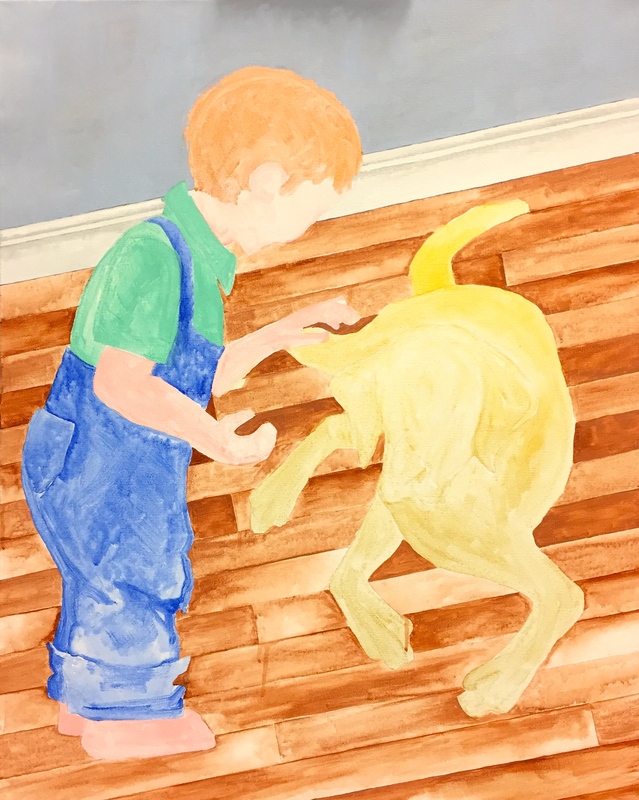 I choose which ever color excites me and fill in the blank spaces; gold dog, green shirt, orange hair, blue wall, yellow floor, pink skin. I know these colors are too bright but they give the composition an energetic start. Their juxtaposition with one another helps me decide where I want the real color palette to go. With the second layer I refine the colors and change completely any colors I thought to be wrong; the shirt is lime not green, the hair is golden brown not orange. This second layer is where major details get laid. The third layer of paint is to enrich the work of the second layer. The darks get darker and the lights get lighter. Four phases and a new painting is complete. From the first discussion I had about this painting I knew it was going to be full of new challenges, all of which I was thrilled to embrace. For starters, I have never before painted someone’s dog. In this instance I was going to paint a dog (from life) and give him a friend and give him an environment. I am quite comfortable painting from photographs. It is beyond my comforts to create elements of a composition beyond those that exist. It took me around four or five sketches to pin down something that worked. In addition to this new challenge I had a few more needs to fulfill in order to create the time to paint and find a place to paint. I conquered the process of getting the girls enrolled in the childcare system on the Army base and secured space for myself at the Hobby Shop on the base as well. After which I had the ability to drop the girls at daycare every Monday and Friday morning and head to the studio. Twelve sessions of childcare and voila…a pet portrait for a boy’s nursery. 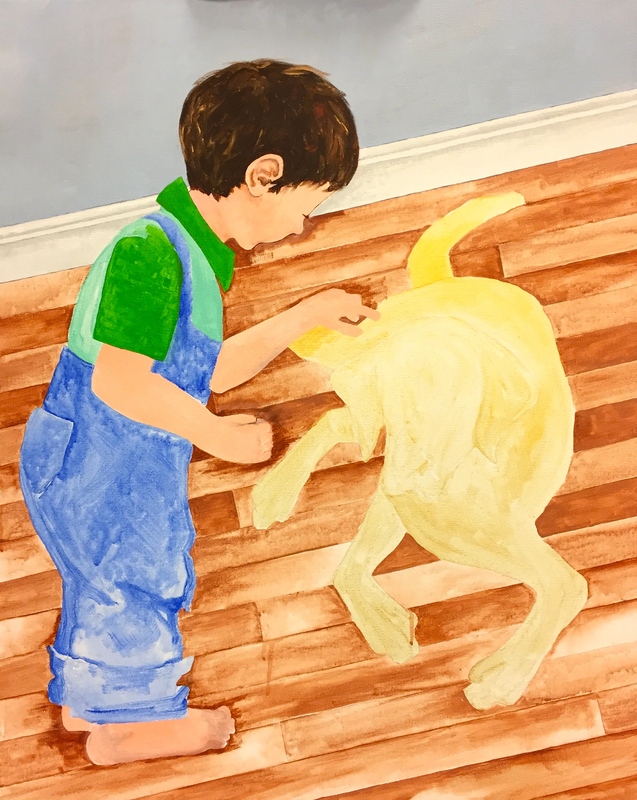 I enjoyed carving out the six hours each week to paint; probably more so than Lila and Nina enjoyed becoming accustomed to going to school. Ultimately it is has made all three of us stronger and we are better for it. It took us roughly two months, but we have all found a few new skills, gained some independence, and strengthened our confidences. The truth is, the work to get this painting complete goes much deeper and is completely unique. It has meant a lot for me as an individual and a mother; making it something of which I am extremely proud. Lastly, I feel compelled to let all of you know that this means I am now officially in the pet portrait business. 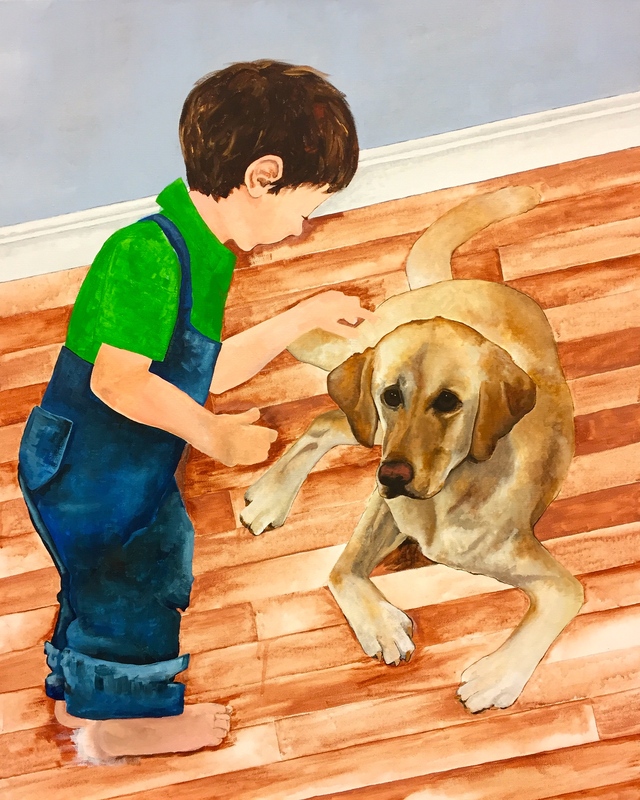 This entry was posted in Creative Indulgences, Illustration, My Art and tagged Babies, commission, Dogs, New Painting, Pet Portrait, Working Mom.